Having our ten-year old niece stay with us this week was a bonding experience that we will always remember. Beneath clear sunny skies we ventured around the city, admiring the vibrant spring blooms that brighten this grand metropolis. We escaped high into the hills, surrounded by fragrant Eucalyptus trees, stopping by the Griffith Observatory for an evening at the museum as well as a fascinating show on Northern Lights at the Planetarium. We visited the Long Beach aquarium, went swimming at the house where Adam grew up, and spent quality time in our garden preparing the soil and planting tomatoes, basil, kale, and zucchini. We cooked together and swapped kitchen tips: we taught her how to separate eggs for matzo ball soup, and she showed us her recipe for strawberry-ginger lemonade using freshly-picked fruit from our lemon tree. The entire week was filled with memories that we will cherish forever, and since we dropped her off at the airport yesterday afternoon, the house feels quiet without her. But we are jumping right back into the kitchen and are excited to announce our first double post with a fellow blogger! Together with Apartment Bartender, we are sharing two tropical-inspired recipes for all your Spring entertaining needs! Check out the refreshing Mango Cooler cocktail he created at apartmentbartender.com, while we introduce you to a sweet and savory appetizer that is a delicious and colorful companion for his bubbly tonic: Tostones with spicy mango salsa! Let us transport you to a tropical paradise. 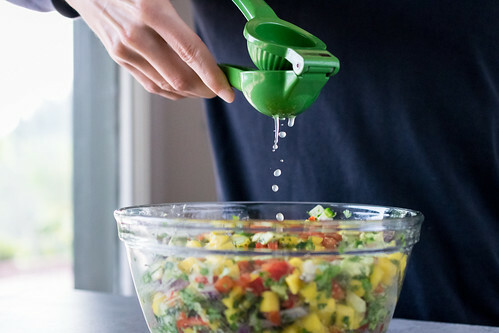 Diced juicy mangoes are tossed with chopped bell pepper, red onion, and fiery slices of jalapeño, which mingle with cool cubes of cucumber and creamy avocado. 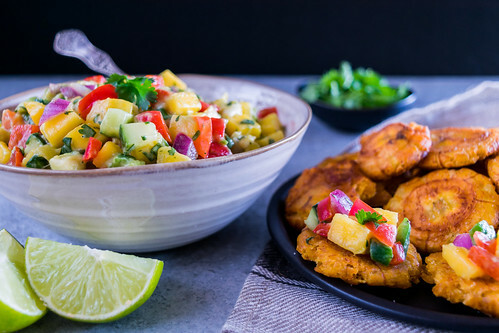 Topped with freshly-squeezed lime juice and handfuls of fragrant cilantro, this simple, sweet, and spicy blend is the perfect topping for the hot and crunchy plantain bites known as tostones. 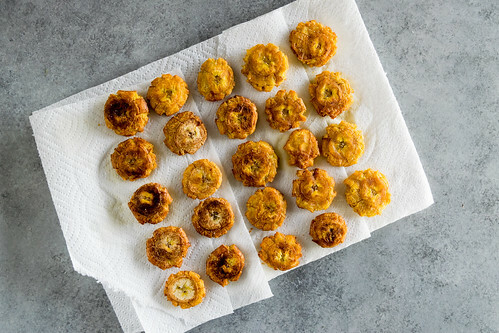 Tender, golden, and delicious, tostones are a popular dish traditionally served throughout latin america and the caribbean, and while Ryan grew up enjoying them for dinner alongside Cuban delicacies like black beans and yuca, they also make an ideal appetizer for parties! Savory, salty, and topped with the fresh spicy mango salsa, this addictive treat will be the hit of your next fiesta! 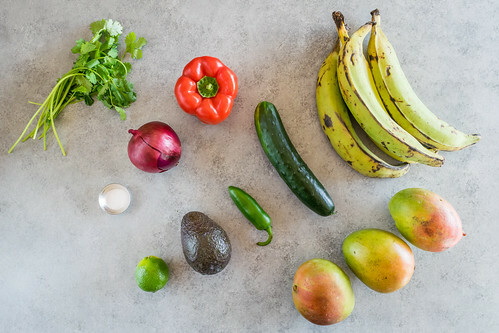 This simple tostones recipe uses just three ingredients, and the prep couldn’t be easier. Since the salsa can be made ahead of time and the tostones cook quickly, this tasty and colorful spread comes together in just minutes. 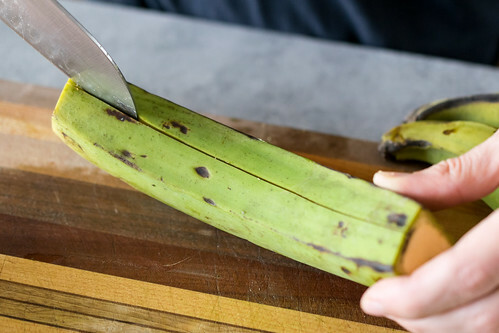 It starts with green plantains—so firm that the peel needs to be cut with a knife. The tropical fruit is sliced into thick rounds, lightly fried in a skillet of sizzling oil until both sides are beautifully toasted. Then, as you can see in the animated gif below, the real fun begins as you get to smash each one! After being flattened with a heavy can, dinner plate, or even the palm of your hand, they are quickly fried once again and topped with a generous sprinkle of sea salt. 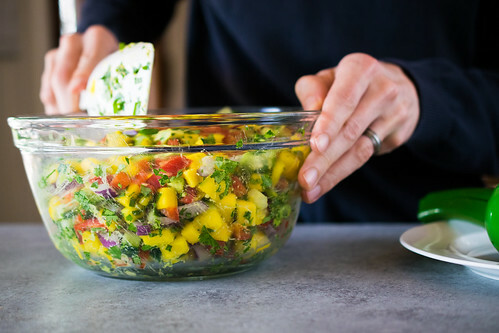 So dust off your sandals, turn up the Buena Vista Social Club, serve this festive appetizer alongside a refreshing Mango Cooler, and your tropical paradise is just moments away. 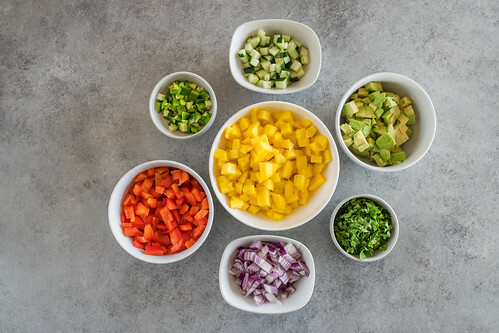 Combine all the salsa ingredients in a bowl, toss until evenly mixed, and let sit for at least 10 minutes while you prepare the tostones. Stir, taste for lime and salt, and add more as needed. 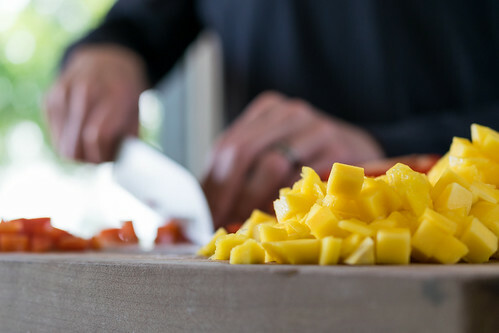 First, cover a plate or cutting board with a few layers of paper towels to drain the plantains after frying. Peel the plantains by making a slit through the skin and peeling it off. 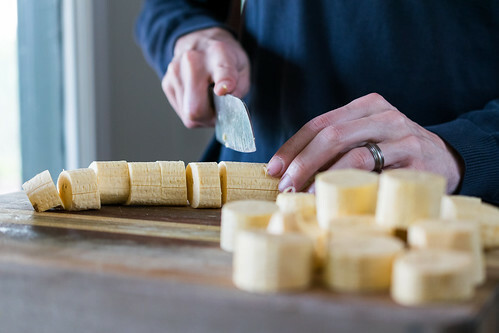 Slice the plantains into thick 1-inch rounds. Place a heavy skillet over medium heat, and pour vegetable oil in the pan until it is about 1/4-inch deep. Once the oil is hot, test it by dropping in a small piece of plantain: if it bubbles, then the oil is ready. 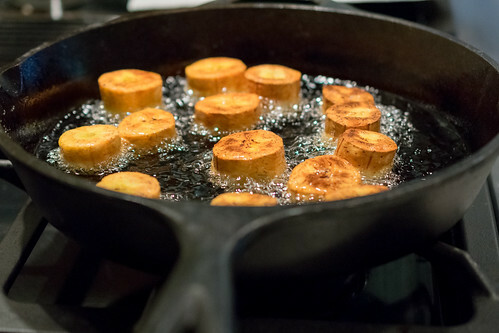 Place a few plantain slices flat-side-down in the oil, leaving space and not crowding the pan too much. Cook until the bottoms are golden brown, 2 to 3 minutes. Using tongs, flip the plantains over so the other flat side is in the oil. Cook for another 1 to 2 minutes, until golden brown as well. 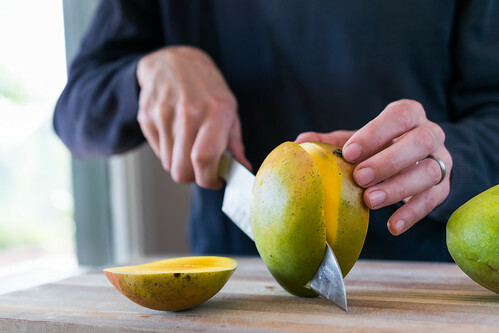 Remove the slices from the pan and place on the paper towel-lined cutting board. Repeat until all the plantains are cooked. Now we are going to flatten the plantain slices. Place a paper towel on a cutting board, then put one plantain slice on it, flat side down. 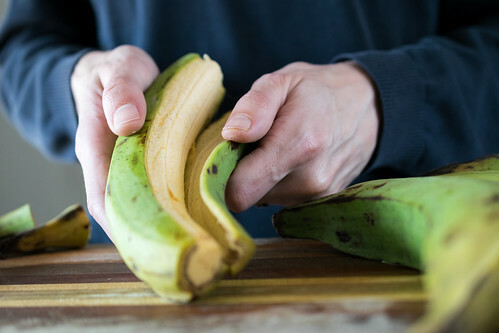 Place another paper towel over the plantain, then take a heavy item like a large can of vegetables and press it firmly down on top of the plantain, flattening it. You can also do this with the palm of your hand. 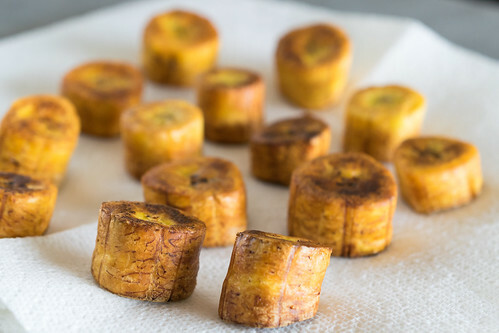 Once the plantains have been flattened, return them to the oil in batches and fry each side for an additional 1 to 2 minutes, until crispy and golden brown. Remove from the pan and place on paper towels to drain. Sprinkle generous pinches of salt on both sides of the plantains, serve hot, and enjoy! I absolutely love this! So fresh and colorful. It reminds me of vacations and my childhood! Awesome work guys! Thanks Christine! So cool that you grew up enjoying tostones too! Did you also have platanos maduros? They’re so sweet and delicious, almost like dessert! Thanks Deb! Hope you had a fun at your Jewish/Irish Easter feast!